We do live in a world, though, where some problems are swept under rugs and left to molder, where some issues aren’t a big deal but others are paralyzingly embarrassing. We live in a world — all of us live in a world, no matter which world we live in — where no matter how you define perfection, the ability to enact perfection convincingly is highly valued. We also live in a world where the rate of drug abuse is skyrocketing, where the opioid crisis is making itself felt even in places where no one ever imagined it could be felt. In places like the local Jewish community. According to a March 2018 report by the National Institute on Drug Abuse, part of the National Institutes of Health, more than 155 Americans die of drug overdoses every day; opioids include prescription medications, synthetic opioids, and heroin, among others. It is a horrifying statistic. It does not include deaths that are alcohol-related, although, according to the Centers for Disease Control, in 2010 approximately 88,000 people basically drank themselves to death. There are very real mental health issues that underlie these statistics, as well as social policy decisions. There also is the fact that addiction is a very real physical phenomenon, not a moral failing, and that some people’s body chemistries make them more likely than others to develop physical addictions. It is a messy and unpleasant subject. Often it is easier to stigmatize people who develop drug or alcohol dependencies as morally delinquent than it is to acknowledge the illness and help them recover from it; the fact that there is no simple remedy, no magic pill, no penicillin equivalent, makes treatment hard and complete recovery sometimes chimerical. Given all this, given the stigma that envelops drug and alcohol use, and given the close-knit nature of the Jewish community, and the myth that Jews never fall prey to such problems, it takes courage for families to admit that they have that problem. But of course, once those families do take that step, the easier it becomes for others to admit to their own problems. Because it is even harder to deal with drug abuse when people feel isolated by it, because there is strength in these numbers, the more people come forward, the better it gets. That’s why the Forman family of Teaneck has decided to go public about the problems their daughter Elana, the second of their five children, has had with substance abuse. They will be on the panel at TABC next Sunday. Elana is now 23; she lives in Florida and is very public about her story; “I’m pretty much an open book,” she said. But that wasn’t always the case. It took years for her parents, who are careful and loving and diligent and very smart but did not know what they were seeing, much less what they should be looking for, to understand what was going on with her. Lianne and Etiel Forman both are attorneys, who met at Columbia while they were in law school. They moved to Teaneck, and their family flourished; Elana, like her siblings, went to day schools and did very well there. “Basically I was a child just like anyone else,” Elana said. “And then, right before high school, I started feeling that I wasn’t like my peers. I felt lonely and misunderstood. And my solution, the way I found to cope with these feelings, was alcohol. “I started drinking when I was about 13. I took it from my parents’ liquor cabinet, and I associated with friends who were doing the same things. We all took from our parents, and we had older friends who were able to buy it. “We did it mostly on Shabbas. We would drink and smoke weed. It was just basically to cope. I felt like everyone else knew what they were doing, and I felt completely lost. 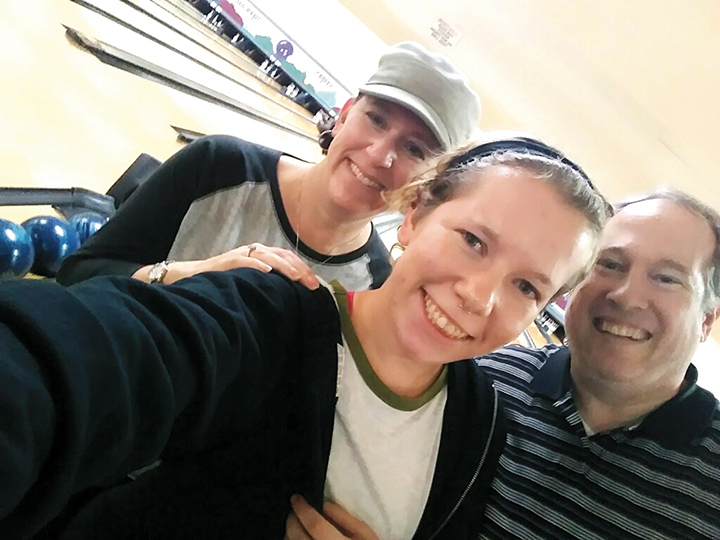 On a recent visit to Florida, Lianne, Elana, and Etiel went bowling. But Elana also was a skillful performer, and she was smart and a good student. “I was active in school,” she said. “I played on sports teams, I was on academic teams, I kept up with everything. I was able to maintain a façade. But it wasn’t depression. It was substance abuse. Elana’s substance abuse got dramatically worse when she went to college. “Then I had freedom, and I got into harder drugs,” she said. “Then my eating disorder was under control, but I had the same issues underneath, so once I had that freedom, once I was outside the little bubble I grew up in, that’s when I started getting into pills. As she had in high school, Elana threw herself enthusiastically into school activities. She was at Queens College, and “I was active in Hillel and in the community,” she said. But she started taking pills, “self-medicating, so I could keep up and live life,” she said. “But I wasn’t getting high to enjoy myself. It was a way to survive. I took Adderall during the day to keep up with my job and my schoolwork, and I would take downers at night so I could get some sleep. It wasn’t hard to get pills on campus, she said; she had a prescription for Klonopin, and she could trade that for other medications that she liked better. She also used cocaine, which was widely available. “Any time something was offered to me, I said okay, I’ll try it once. Something was always missing, so when someone said this will be great, I said okay. I didn’t have any built-in fear. Trying it was a no-brainer, and if I didn’t like it I wouldn’t do it again. “But there wasn’t much that I didn’t like. Elana made it through two years of college, but it wasn’t easy. “I had a couple of psych ward visits, and eventually, it all crashed in on me,” she said. She’d kept her parents more or less in the dark about her problems, but the school called them. They sent her to Israel, on a program for “troubled young adults.” It worked at first — “the geographic change was helpful, and it was good to be away from my friends, with a whole new set up and new support systems — but the drinking age is lower there. I wasn’t 21 yet, but all of a sudden I was able to buy alcohol legally. I was buying bottles of vodka and having them in my room. Elana’s unhappiness kept growing, and “I ended up trying to kill myself,” she said. “I had intentionally overdosed.” But she was discovered, and her stomach was pumped, and then she was sent to rehab. “I was there for three months,” she said. “It was helpful because I literally didn’t realize that I was drinking to avoid emotions. I was inept at dealing with life. “I obviously knew it was wrong to use illegal drugs, but it wasn’t something that I talked about or realized was a sickness until my first time in rehab,” she said. Then the Formans had to figure out what to do. Several years earlier, they had learned a great deal about mental health issues and eating disorders, and they thought that they could tackle this issue the same way. 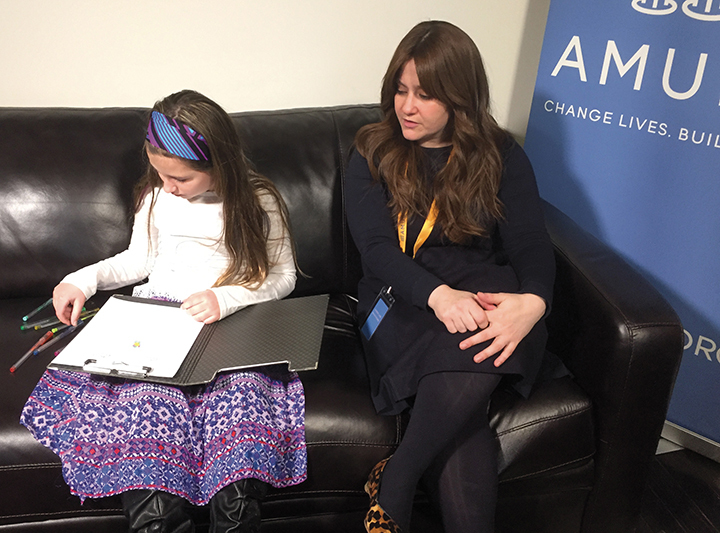 “We looked for resources, and we didn’t find much in the Orthodox community,” Lianne said; much later, after Elana had already moved to Florida and been to rehab, she found Amudim, which provides case management for families with members struggling with drug and sexual abuse. Its founder and executive director, Rabbi Zvi Gluck, will be at the April 22 meeting. They had to adjust to an entirely new way of dealing with Elana. “The newest way of thinking about eating disorders and parent involvement then,” when Elana was in high school, “was that your child cannot make healthy choices,” Lianne said. “They are so sick that they would starve themselves to death.” So the family used family-based-therapy, which dictated that the parents make all the decisions; that approach wouldn’t be possible with an adult child anyway. Now, they went to Nar-Anon, a 12-step program for the families of substance abusers. “You have to understand that this is out of your control,” Lianne said. “This is not your problem. You cannot make it your problem. Rabbi Ace Klatzko talks with a client at Amudim. “There were so many stories in that room. There was the man with the 30-something son who is in and out of rehab, and he doesn’t know what to do. There is the man who comes home to find his wife drunk all the time, and he feels that he should stay home with her, but he can’t, and he doesn’t know what to do. Lianne found a practice in Jersey City that specializes in addiction, and that practice found a rehab in Florida; Elana went there on her own, and has been in Florida ever since. Once she was done with rehab, she went to a halfway house, and then a three-quarter house; those residences have monitoring and oversight, appropriate for their level of care. Also, “we got lucky,” she said. “When we were struggling with where she should go, we found a connection, an Orthodox guy in Brooklyn who is a recovering addict and helps families find the right rehab, and helps them with their insurance.” This man, Ezy Finkel, will be at the meeting next Sunday. “He’s an amazing guy,” Lianne said. And it is Ezy who introduced Lianne and Etiel to Rabbi Gluck. Closer to home, though, she still didn’t find much help. “In the year and a half since we’ve known about this, I have not met another family in Teaneck who is dealing with this,” Lianne said. “This cannot be. There is an epidemic in the whole country. It cannot be that we are immune to it. Elana still is in Florida; she’s been back and forth, clean and not so clean, but now, she says, she is clean, and she thinks that this time it will take. She had some severe setbacks in Florida; it wasn’t until after she was in rehab that she shot heroin. “I had smoked it before, but I had never shot up. This was the first time I did, with a needle. It is as physically addictive as anything. “Even back in high school, smoking weed, I was afraid of needles. People who shot up were scary people, who lived under bridges. They were criminals, in my mind, who stole things. But that same mentality I had before — that if something was offered to me, I’d just say yes automatically — I was constantly searching for the external thing that would make me feel better, but I never found it. Luckily, Elana stopped shooting heroin before she became addicted physically. It was around then that the epiphany that she thinks will keep her off drugs happened. “I don’t know how to explain it, but in the program, we call it a spiritual awakening,” she said. She found herself in rehab against her will; she’d been so high when she was checked in that she didn’t remember it. “But in those last two weeks, something just clicked in my head. “Until then, the most important thing to me was me. It was ‘Am I feeling okay?’ And if I wasn’t I had to get high. “But then it just clicked that the world is not necessarily all about me, and how I feel. There are approximately 7 billion other people in the world besides me, and when I get high to escape my own internal feelings, I am screwing over at least one of them. I’m screwing over my own parents. Why am I hurting them? Why am I more important than they are? But she is moving toward the light. “For me, the 12 steps are the solution,” she said. “So I started going to meetings and working a program. It’s not therapy. I don’t do therapy anymore. I don’t have to talk about my problems. I have an outline of how to deal with them. “Now I am in the process of rebuilding my life and myself. I have friends down here. I have a job. It’s not my dream job — I deliver pizzas — but it is a legal job, that I hold down, and I have a car that I bought for myself, and I have insurance that is in my name. She wants the Jewish community to realize that she is not an outlier, and that addiction is a threat there as it is everyplace else. “I would say that in the Jewish community, in general, it is taboo to talk about drugs. I found that when I was going through what I was going through, I had to keep up the façade that everything was okay or I would be labeled as the bad kid, and parents would tell their kids not to hang out with me because I would be a bad influence. “Of course, they might have been right about that,” she said parenthetically. Elana also “struggled with spirituality,” she said. “That is also taboo to bring up in the Jewish community because it is assumed that as a Jew you have a God who you believe in. But some people don’t feel a connection to God or are still struggling with it. What it came down to for me is that addiction is a spiritual hole, and I found that there was no outlet for me to talk about any of that stuff. I couldn’t be caught questioning God, and I felt that there was no room for questioning. “There has to be room for that discussion. There are too many things that are taboo, and it leads to too many people struggling. The panel next Sunday evening will include Mr. Finkel, the recovering addict; Rabbi Gluck, who heads Amudim, and Rabbi Laurence Rothwachs of Congregation Beth Aaron in Teaneck. It also will include Etiel Forman, who will speak publically about Elana for the first time. “Our motto lately has been go big or go home,” she said. Amudim offers help in the metropolitan area and beyond. In other words, there is nothing to hide. “And Elana said ‘Go for it,’” Lianne continued. And it is important to all of the rest of them to show Elana that they are not ashamed of her. “By our using our name, and her name, it shows that we are not ashamed,” Lianne said. “I think that our message will be very clear,” she continued. “We are the kind of family that people would never suspect this could happen to. Elana got into Macaulay Honors College; she played varsity soccer, composes music, is a very talented pianist, and always was at the top of her class academically. My husband was president of TABC and we are very involved in the community, and in charitable work. “It is important to talk about this both because it is important to destigmatize, and also because families feel isolated and alone,” Lianne concluded. It’s good for parents to learn “how to detect and prevent substance abuse. Rabbi Zvi Gluck, who heads Amudim, began his work with what is called the “at risk community” — a term he loathes because “who decides who is and who isn’t at risk?” — in 1998, when he was 19. “A friend of mine had passed away from an overdose, and another friend had committed suicide,” he said. “I started volunteering at a drop-in youth center then.” He’s from Brooklyn; “I’m a chameleon,” he said. “Our father raised us to be involved in all communities. I went to a chasidic school, but I was more worldly than the average person who went to a chasidic school.” He worked as a liaison for the New York City police department when he was in college, and he continued to work with teenagers and young adults; he got smicha in 2002, “but I used it mainly for public service work,” he said. At the beginning, his work was more or less ad hoc, “just Zvi Gluck trying to help people,” he said. He always had a day job. He found himself spending more and more time raising money for specific people, going to potential donors and then asking the would-be recipients to get in touch with them personally. He lacked the standing and infrastructure to move funds from donor to recipient himself. “In 2014 I was at a dinner party with supporters, and one of them said, ‘This is getting ridiculous. You need do so something more formal.’” He demurred, but in the end, he gave in. Amudim was born in 2014. It is housed in lower Manhattan. “Our original mission statement was about crisis intervention, with a primary focus on sexual abuse,” Rabbi Gluck said. “It was to create awareness and break the stigma and let people get the help they needed. It also was to create better services for people who needed help, particularly in the underserved community. Amudim is a case management agency; it matches people with services and provides oversight for them over a wide geographic range. Most of its clients are Orthodox and from Brooklyn, but many are not. 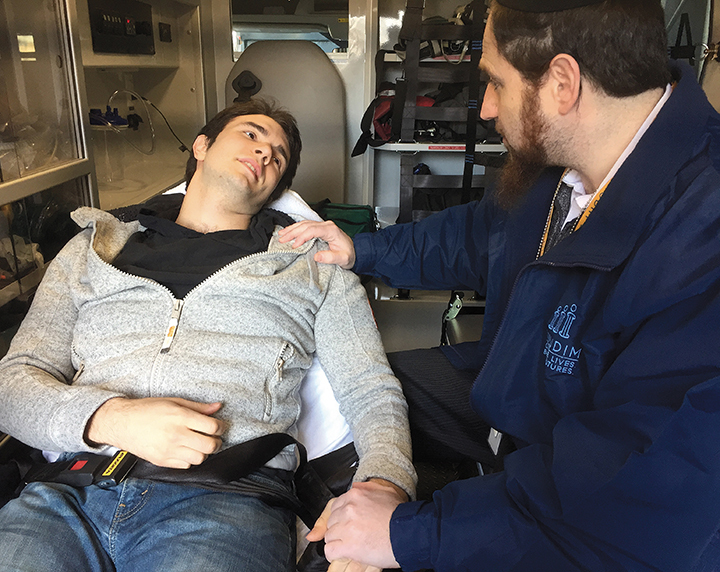 “All the staff are clinicians, not because they have to be, but because I opted to have staff who are not just paper pushers but know what they are dealing with,” Rabbi Gluck said. The agency has served about 4,000 clients so far and has an open caseload of 1,300. That includes 65 clients in north Jersey, 200 in south Jersey, with many of them from Lakewood, and 87 in Rockland County. Many of the clients suffer from both sexual and drug abuse. Amudim does not limit itself to Orthodox Jews, or even to Jews at all. But it is alert to specifically Jewish needs. “On Pesach, we found appropriate places for recovering addicts where they can go to a seder and have no problems with the four cups of wine,” Rabbi Gluck said. Because sexual abusers often victimize family members, Amudim can help those victims avoid spending multi-day chaggim in the same house, sharing bathrooms and meals with their abusers. That’s cultural sensitivity at work. Rabbi Gluck frequently speaks publicly, and he is almost always accompanied by an American Sign Language interpreter. “Victims of abuse and addicts might have family members who are deaf, and they also need to be able to get access to the help they need,” he said. There are some local Jewish groups where parents can go to meet other, similarly situated parents, and talk without feeling judged. The well-credentialed, board-certified psychiatrist, a former president of the New Jersey Society of Addiction Medicine, who lives in Teaneck, said that he started the program five years ago, when he was approached by parents “who didn’t know what to do. They felt isolated, and like they needed to talk to other people who knew what was going on. After a needs assessment, Dr. Berman concluded that the group most in need of help was the parents. “They were totally at a loss,” he said. “They didn’t know how to deal with it. They didn’t know what to do after the kids had started to get treatment. They didn’t know who to be open with. They didn’t know how to deal with what to say when they were asked about their kid, with the aftereffects of not going to Harvard but to a job at Starbucks — and having that job at Starbucks be a very productive, good thing. “And what do you do when the kid relapses? Or when you have first detected the problem? When he says kids, Dr. Berman elaborated, most often he means people ranging from 18 to 30, although some may be as young as 16, and others as old as 33. The group does not provide therapy; he facilitates what is mainly a parent-led discussion. It meets about twice a month, and there is a minimal fee. It’s drop in; to learn more about it, call Carol Leslie at the JCC at (201) 408-1403 or email her at cleslie@jccotp.org. The Teaneck-based Jewish Family and Children’s Services of Northern New Jersey also hosts a group. This one is offered by JACS — its full name, which does not map particularly well to its acronym, is Jewish Alcoholics and Chemically Dependent Persons and Significant Others. “It’s a monthly support group for Jewish people in recovery and their families,” Dr. Vincent Vaccaro of Cliffside Park, a longtime supporter who sits on its board, said. “It’s a self-help group,” which makes it different from the professionally facilitated (but not led) Strength to Strength. To learn more about JACS, call (201) 837-9090 or email info@jfcsnnj.org. When: On Sunday, April 22, at 8 p.m.
For more information: Call (201) 837-7696, or email TABC.org.